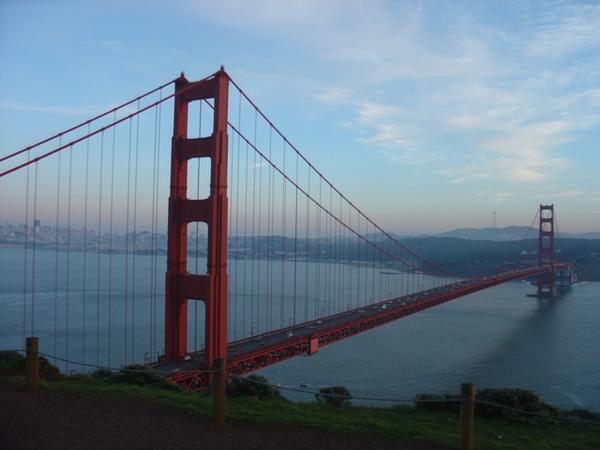 As you've probably guessed, we're home from our trip to San Francisco and Sonoma. We had a great time, saw some great sights and, of course, enjoyed some great meals. But this post is about one meal in particular -- the best meal we had in San Francisco. No, it wasn't the dinner we had at Zuni Cafe, though that was romantic, delicious and amazingly fresh. And it certainly wasn't our visit to Rubicon -- a great meal in terms of the food, but god awful in terms of the service and overall experience. No, our best mean in San Francisco was technically in Oakland, and was cooked by the Obsessed One. Great food. Anyone who knows Derrick knows that the food is going to be good if he's cooking it. I don't mind putting that pressure on him one bit...he always seems to be up to the challenge. Great wine. If you had to pick any one wine blogger to supply wine for dinner, who would it be? (Don't lie to yourself, it's not me). Alder of Vinography was in attendance with his lovely wife Ruth. He introduced us to some tremendous California wines (to go with Derrick's California-sourced menu). Wow. From the amazingly balanced chardonnay to the can't-get-it-anywhere rose to the six (that's right, six) pinots to the knock-me-over (in a good way) zin, these wines were beyond terrific. In fact, they were the best wines we tasted on the entire trip (Sonoma jaunt included). Thanks for sharing them Alder. Great friends. The blogging community is a funny thing. Even though this was only the second chunk of time I'd spent with Derrick, Melissa, Fatemeh and C -- and the first time I'd met Alder and Ruth -- it's hard not to count them each as a friend. Shared passion for the finer culinary and vinological things in life bring people together. What a great evening. Check out the complete menu and wine pairings. Don't be too jealous, okay? Last fall, when Leucadia National Corporation bought Broadfields Wine Cellars from Robin and Karen Meredith, it led to the closing of Long Island’s only two co-op tasting rooms for small, artisanal wine producers, both called The Tasting Room. This weekend, the owner of a winery who used to sell wine through the two locations is re-opening the Peconic location under the same name. Theresa Dilworth of Comtesse Thérèse, who will run the operation, is The Tasting Room’s third owner in nine months. Founded by the Merediths in May 2003, The Tasting Rooms in Peconic and Jamesport were acquired by Leucadia in October 2005. Leucadia operated the cooperative tasting room concept from November 2005 until March 2006, at which time both Tasting Room locations were abruptly closed, much to the chagrin of local winery owners and wine lovers. Not only has Dilworth re-opened one tasting room location, she’s increased the number of wineries involved. Participating wineries include Comtesse Thérèse, Diliberto Vineyards (a real coup if you ask me), Schneider Vineyards, Sherwood House Vineyards and Ternhaven Cellars. “The Tasting Room is a way for small wineries like myself, who cannot afford our own tasting rooms, to pool their resources and offer wine tastings and sales in a single location,” said Ms. Dilworth. Comtesse Thérèse, a ten-acre vineyard located in Aquebogue that is owned by Dilworth and two business partners from Japan, is the only all–female owned vineyard on Long Island. Dilworth is also planning to open a bistro in Aquebogue featuring an exclusively Long Island wine list and locally grown foods. Schneider Vineyards and Sherwood House Vineyards, similar to Comtesse Thérèse, have participated in the original Tasting Room concept since 2003, while both Diliberto Vineyards and Ternhaven Cellars are new to The Tasting Room line up. “Both Diliberto and Ternhaven fit the profile I was looking for, which is small quantities of hand-crafted, boutique, North Fork of Long Island wines,” said Dilworth. Dilworth is looking to expand the roster of wineries even further, and may be adding more in the next month or two. Most of the participating wineries produce fewer than 1000 cases annually, with lot sizes of individual wines ranging from 50 to a few hundred cases. The new Tasting Room will occupy only half of the original Peconic location. The other half will house newcomer North Fork Wine Cellars, owned by Stephen A. Distante, a Peconic resident who is also CEO of Vanderbilt Securities of Melville, New York. North Fork Wine Cellars, which plans to open July 1, will offer custom wine cellars and wine refrigerators, glassware, and accessories, in addition to winery tours and wine education. Christopher Watkins, previously the manager of The Tasting Room when it was operated by both Broadfields and Leucadia, will continue as manager of both The Tasting Room and North Fork Cellars. The former Tasting Room location in Jamesport has been converted to Leucadia’s regional vineyard office. 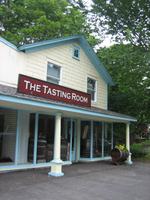 The Tasting Room, located at 2885 Peconic Lane in Peconic, will be open Friday – Sunday, 11 a.m. to 6 pm. For more information, call 631-765-6404. I asked Williamson about the decision to can Butternuts beer rather than to bottle it. "The first reason to put the beer in cans is that it's different," he said. "Also it's more shelf stable. You won't have any problems with the beer getting light struck. And, canning is environmentally friendly. Aluminum cans are ninety-seven percent recyclable." He said they wanted to market the beer to markets where bottled beer couldn't go like golf courses. "We want to brew an approachable beer for the common man," said Williamson. "That's why our beer is priced so reasonably." Of course, canned beer historically has been viewed as a second-class product by the craft beer community, but that's all changing. A number of craft brewers are starting to can their products. 21st Amendment Restaurant and Brewery are canning some of their beer. The Brookston Beer Bulletin has an excellent article on canning beer. The New England Brewing Company is canning their beer as well. They have an Amber, a Lager, and an IPA -- all in cans. Butternuts is using a five-head canning system from Cask Brewing Systems Inc. a Canadian company supplying "small scale brewers and packagers worldwide." Butternuts is the only brewer in New York using this type of canning system. Chuck Williamson said, "We want to have a strong presence on Long Island and in the five burroughs. You should be seeing a lot of our beer in the future." But what does the beer taste like? Porkslap pours orange and crystal clear producing a frothy white head. There's a initial vegetal aroma when first popping the can, but that gives way quickly to a malty aroma livened with lemon spice. When you bite into the beer the first thing you will notice is the hop bitterness. The character of the bitterness is tea-like. I found this beer easy to drink and most thirst quenching. I would drink this straight on a hot day or pair it with spicy food, perhaps spicy pepperoni pizza or Mexican food. Williamson said this beer was not a typical Pale Ale. It's a new interpretation of a Pale Ale. The lemon-spice character is unique in my experience. Butternuts has certainly added something new to the Beer World with this creation. Williamson described the Heinnieweisse as a traditional Hefeweizen. Prior to opening the can and decanting, give the can a good roll on the countertop to rouse the yeast. When you pour you'll want to see that nice wheat cloudiness. Immediately on opening you should note the estery aroma. This beer is a fine balance of banana and clove. It's a pale straw color. The taste is a combination of effervescence, sweetness, and tart with a peppery finish. Any one of those elements if dominant could throw the beer out of balance, but in the Heinnieweisse the combination is superb and fresh. Freshness is important. Hefeweizens are not beers that you should let hang around in your beer cellar. Buy these as fresh as possible and drink them promptly. To my taste the Heinnieweisse stands up to any of the German Hefeweizens. There's no way that a beer imported from Germany can be as fresh as a beer you buy in your own state. For all you beer drinkers who think you don't like Hefeweizen, give Heinnieweisse a try, it might show you what this style was meant to be. For years, The Lenz Winery in Peconic has been one of the North Fork’s most respected and successful producers. Together, vineyard manager Sam McCullough and winemaker Eric Fry comprise one of the East End’s most experienced duos. Their experience and familiarity with North Fork growing conditions and fruit results in some of the area’s best wines — wines that the Wine Spectator was insane not to include in its recent New York-themed issue. You’ve no doubt read about Fry’s merlot and how it rivals Bordeaux’s best at a fraction of the price in professional blind tastings. Those wines are well regarded for a reason — one needs only to taste them to understand. But, Fry is more than a merlot maestro. He’s the baron of bubbly and his talent is responsible for many of Long Island’s best sparkling wines, both at Lenz and at other wineries. The Lenz Winery 1994 Cuvee RD ($50) is a well-aged combination of pinot noir and chardonnay that is well worth the price. RD stands for recently disgorged. Disgorgement, degorgement in French, is the part sparkling wine making that involves releasing the cork to let out a small amount of wine that contains sediment and then topping off the bottle with wine and a new cork. Fry believes that RD wines should be enjoyed soon after this process — just as beer is best when fresh. Rich, expressive and funky (in a good way), the nose is toasty, yeasty and nutty with underlying apple-pear character. The palate features flavors that closely match the aromas, with medium body, vibrant acidity and a refreshing, apple-y finish. Too often, sparkling wine is thought of only on New Years Eve and for wedding toasts — which is a shame. Sparkling wine is perfect with a wine array of foods and this upscale bottling is deserving of a place at your dinner table. Fry also does nice things with gewüürztraminer, the spicy, floral grape of Alsace. The last two releases have been nothing short of delicious, but Lenz Winery’s 2004 Gewurztraminer ($20) seems a little less intense. Floral and somewhat spicy on an austere nose, the palate is a bit flat compared to the 2003. Some light, citrusy pineapple flavors come through with a little ginger spice, but the balance seems a bit off to me. Fry’s chardonnay program is another that sometimes gets lost in the mélange of merlot tastings. The Lenz Winery 2004 Gold Label Chardonnay ($20) is a example of chardonnay with significant, but not over-done, oak influence. Medium gold in the glass, the nose is reminiscent of honey-roasted pears with some toast and butter hints as well. Balance is important in every wine, but more so with chardonnay than some — it’s easy to over-oak chardonnay’s fruit flavors. This wine may have a bit more oak character than I prefer, but the balance is still there. The texture is somewhat creamy and medium bodied with subtle acidity. Apple and pear flavors peek through toasty oak and dried fruit flavors — particularly on a persistent finish. For just five dollars more, I can’t recommend the Lenz Winery 2004 “Old Vines” Chardonnay ($25) enough. “Old vines” is a term without official meaning (much like “reserve”) but the grapes that go into this wine are from some of the oldest chardonnay vines on Long Island. An elegant, but intense nose offers fresh apples and pear with subtle oak and vanilla accents. 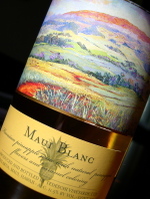 Clean chardonnay fruit flavors are balanced extremely well with delicate oak undertones and nice acidity on the finish. This is an example of what East Coast chardonnay can be and what West Coast chardonnay is not. California winemakers wish they could make this stylish wine. I had dinner at Cafe Claude tonight. It was pretty good. Solid coq au vin and a tasty, fresh salad of beets, snow peas and feta. I bit the bullet tonight and picked up a bottle of CA chardonnay. I won't go into details, but as I sit here sipping it's making me miss home. Nena joins me here in SF tomorrow and my conference wraps up. So, I'll be on vacation soon enough. I'm a few days behind, but this week Joel from Vivi’s Wine Journal announced the upcoming, and 23rd, edition of Wine Blogging Wednesday. His theme is one that is near and dear to my heart Bar-B-Que wines. Joel has left the 'rules' pretty wide open...just pick a wine to drink with a grill/smoked/barbequed meal. I know that most people drink beer with such eats...but not in the LENNDEVOURS house. Well, we do drink beer, but there is always wine around too. So, join us on July 5 and find out what other wine and bbq lovers are eating with their smokey seared food. It's been a looong day, but I'm in San Francisco! After getting out of bed at 4 a.m. ET to catch a 7:15 flight out of JFK...I've had quite a day already and I'm trying to stay awake a few more hours to help with the time zone change. I'm an idiot. Looking at the map, the walk from the Powell St. BART station to my hotel looked like "only ten blocks" which isn't much of anything in NYC. So I decided to walk instead of taking a cab. Let's just say that Nob Hill (where I'm staying) seems like more of a mountain than a hill when you're lugging your laptop, luggage and half a case of wine. At least I won't have to use the work out room. What's up with all of the Subway restaurants? In my lengthy walking travels today, I bet I saw at least seven or eight of them. I walked down to the Ferry Building. What a place...it's like a mall for foodies. I ended up eating duck confit tacos with mango salsa, shredded cabbage and jalapeno-cilantro sour cream at Taylor's Refresher. They were pretty tasty, but the star of the meal was the blueberry milkshake. I also stopped by Ferry Plaza Wine Merchants. I probably would have bought more than the one bottle of local zin if I didn't know I was walking back up the hill. Nena and I will definitely be going back to the Ferry Building after she arrives Saturday. Between the fresh bread, cheese, produce...it seems the perfect place to go to stock up for a picnic. Today over at Wine Sediments, the 50 in 50 project continues with a trip to Hawaii's Tedeschi Vineyards. Yeah, they grow grapes in Hawaii, but the wine I tasted is made from fresh pineapple. Unlike a lot of wine geeks, I'm far from anti-fruit wine. In fact, I've had some truly amazing ones. Sure, they aren't "fine wine" in the traditional sense, but snobbery is never a good thing. So how did everyone do with their low-alcohol red wines? Looks to me like it went pretty well -- better than some people expected for sure. Tim and Winecast has posted his round-up of Wine Blogging Wendesday #22. Check it out...there are some interesting wines on the list to be sure. And, keep your blog-reading eyes peeled next week for the annoucment about WBW #23, which features a great seasonal theme. Tonight I opened up a Blue Point Summer Ale. The label on the bottle tells me I should be drinking this in the summer sun (perhaps even after mowing my lawn -- that little bit of lawn I have), but I'll have to make due with the summer sunset. My guess is that this beer is intended to be thirst quenching. If I were writing up the specifications for a thirst-quenching beer, I would probably start with something that is just a little bit tart that also finishes dry. I know, a dry beer doesn't sound like it should slake the thirst, but dryness for me is the opposite of sweet, and sweet isn't very thirst quenching at all. I find the finish on the Summer Ale to be sweeter than I would expect for a summer thirst quencher. But sweet is probably okay for this style. "Golden Ale" isn't an official beer style category (Belgian Strong Golden Ale is, but this Blue Point beer is definitely not one of those). The category I would put Blue Point Summer Ale in is Blonde Ale. And a Blonde Ale can have a malty sweetness, so I would call this beer a success. Typically, these beers are not too high in alcohol, between 3.8% and 5.5% ABV (Summer Ale is 4.4% ABV), so having two or three over as many hours isn't going to impair you. 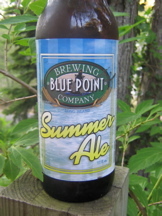 "Blue Point Brewing's Summer Ale has a delicious golden taste. In addition to traditional barley malt, a substantial portion of wheat malt is added to the mix giving this brew a unique tartness that's not found in many beers today. This light, thirst-quenching microbrew is enjoyed by all on a hot, Long Island Summer day." Does it deliver? If there's any tartness there, it's being killed by the sweet aftertaste. The initial prickly bite is refreshing and there is a suggestion of tartness, but my palate is overwhelmed by the malty sweetness. Forgetting beer styles for a moment, I'm going to speak freely and subjectively about my personal enjoyment factor. Is Donavan going to buy a case of this beer and ice it down for a fun day on the beach, baking in the summer sun? Probably not. My summer or lawnmower beer is going to be much drier and a more tart. I'd probably be filling my cooler with Witbier. Unfortunately, Blue Point doesn't brew a Wit (or White Beer). If you don't have access to Blue Point Summer Ale and would like to try other Blonde Ales to see what I'm talking about the BJCP site lists these beers as good examples of the style: Redhook Blonde, Catamount Gold, Widmer Blonde Ale, Coast Range California Blonde Ale, Fuller's Summer Ale, Hollywood Blonde, Pete's Wicked Summer Brew, and Deschutes Cascade Golden. For more reviews of Blue Point Summer Ale see BeerAdvocate and RateBeer. As I've written previously, early next Wednesday morning (too early if you ask me) I leave New York for San Francisco. I'll be in conferences all day Thursday through Saturday, and then Nena joins me Saturday afternoon to make a little mini-vacation/anniversary trip out of things, but...I'm loooking for some suggestions from the booming Bay Area blogging community. I tend to be a lone roamer when I'm on business trips by myself...I just wander the streets in search of something to do. But, given that I have all of you as a resource, I thought perhaps I'd be a bit more targeted. I'm staying in Nob Hill the first few nights before Nena and I move to Union Square area. Today is Wine Blogging Wednesday, hosted by wine podcaster extraordinaire Tim Elliott of Winecast. Tim has participated in most every WBW from its inception, so it's great to finally have him hosting. And, he came up with a great theme. More and more, these types of wines are the exception rather than the rule. Is it global warming? Is it winemakers catering to certain critics? Regardless, I knew I'd have no problem finding a wine for this event. Long Island wines tend to fall in the 12%-13% range in most vintages. So, finding a local merlot at 12.5% wasn't going to be a challenge. Rather than take the easy way, I thought I'd find the lowest ABV in my stash of New York wines. After digging through a bunch of 12-ish% wines, I came upon a bottle of Standing Stone Vineyards 2003 Pinnacle ($21), a Bordeaux-style blend, that comes in at only 11.5% ABV. Standing Stone Vineyards is located in Hector, NY on the eastern shore of Seneca Lake in the Finger Lakes region of New York. The vineyard was purchased in 1991 by Tom and Marti Macinski, with their first vintage happening a couple years later in 1993. They made 800 cases of wine that year and are now up to 6500 cases. I must admit, I've tasted a fair number of Finger Lakes reds and very few stand out in my memory. The region is even cooler than Long Island, so ripeness can be an issue. Most reds tend to be light on flavor (and body) and sometimes winemakers use more oak than barely-ripe grapes can handle. This particularly wine is a blend of 85% cabernet sauvignon, 10% merlot and 5% cabernet franc. The cabernet sauvignon was harvested November 08, 2003 at 21.0 Brix. Fermented using Barolo, BM45 and T73 yeasts, all lots went through a strict regimen of four to five punch-downs per day to maximize color and flavor extraction. Some lots were pressed off before dryness and placed in barrels to complete the fermentation. The rest of the lots went into barrels upon completion of fermentation or after an extended maceration time of 10-14 days. All lots were pressed in a small (¾ ton) basket press and the cabernet sauvignon was placed in newer French and American oak barrels for 18 months before carefully selected barrels were blended. The wine's moderate nose is mostly black cherry with some under-ripe 'green' notes as well. On the palate, medium-light body offers cherry, chocolate and red delicious apple flavors with soft, light tannins and light acidity. Overall, it's not complex but I'm glad they didn't overdo the oak -- the fruit flavors are pleasant, if a little underripe. Would I drink it again? Ask me again tomorrow. I'm going to re-taste the wine tonight to see how it's changed. It is one of the better Finger Lakes reds that I've had. Thanks to Tim for hosting this month's vintage of WBW. And keep an eye out for July's announcement. Check it out. And if you're an East End resident, contact SPAT to learn how you can grow your own shellfish -- keeping half for yourself and cutting the others loose in the bays. Bedell Cellars: About Art. About Taste. Much like food and wine, wine and art are forever beautifully entangled. The splendor of a vineyard as it dances through the growing season begs to be memorialized with a camera or on canvas. And, similarly winemaking, while at its core a scientific undertaking, is a craft done best in the hands of true artisans. Art is necessary to sell wine as well. Wine shops can be overwhelming — shelf after shelf of many different wines from many different locals and many foreign to the consumer. We've all picked up a bottle based on the label, and Australian wineries, perhaps more than anyone else, attempt to capture our attention with brightly colored labels featuring cartoon animals. Wines like yellowtail, Little Penguin and Blue Marlin are well-known examples. That's the low brow way to stand out, however. In their quest to stand out, local producers are leaving cartoons on Saturday morning television and are turning to world-renowned artists to design their labels. Last year, Bedell Cellars released the first wines from it's Artists Series — a 2001 reserve merlot featuring the work of Sag Harbor resident Eric Fischl and two "Taste" wines (one red, one white) with Barbara Kruger's artwork on the labels. Based on the success of those three wines, Bedell Cellars has released two new Taste bottlings -- a 2004 Taste Red and 2005 Taste White (both are priced at $25) and added a new wine to the Artist Series. Bedell Cellars' 2005 Taste White is a barrel-fermented blend of chardonnay, gewürztraminer, viognier and riesling. Its fruity, aromatic nose displays bright citrus, peach and spring flower aromas accented by a sprinkling of toasty vanilla oak. On the palate, it is medium bodied with vibrant acidity. The fore palate is dominated by just-ripe peach and citrus fruit that precedes toasty vanilla oak on the mid-palate and lychee-lime flavors and minerals on the finish. The ripeness of the 2005 fruit really shines through and each component variety contributes to a deliciously well balanced wine. Drink now or over the next three years. Bedell's first release of Taste Red was 100% merlot from the 1999 vintage. This time around, Bedell Cellars' 2004 Taste Red is mostly merlot with 13% petit verdot blended in. Intense aromas of cherries and smoky-toasty oak mingle with interesting faint caramel notes on the nose. This is a juicy (but not jammy) red that is soft and fruity with relatively low tannins. The flavors are straightforward with cherries and raspberries inflected with toasty oak. A tart cherry finish is delicious and makes this wine an ideal companion to a wide range of foods. I think this wine is best enjoyed in its youth — over the next few years. The newest member of the Artist Series comes from Bedell's sister (white wine) label — Corey Creek. The Corey Creek 2005 Gewurztraminer ($25) labels was designed by award-winning photographer Howard Schatz. It features a striking image of a Calla Lily from his most recent book Botanica. The wine inside is reminder that Bedell/Corey Creek is about more than just merlot. Exotically perfumed, the nose offers exotic aromas of sweet rose water, lychee, tropical fruit and spearmint. Bad gewürztraminer tends to be flat, lacking fresh acidity, but this wine is nicely balanced with just the right acidity to go with medium-full body and citrus and tropical fruit flavors (everything from lemons and orange zest to pineapple). To buy these and other Bedell Cellars/Corey Creek Vineyards wines visit www.bedellcellars.com or visit their tasting rooms on Rt. 25 on the North Fork. John Irving Levenberg of Bedell Cellars can be heard this week on Vinetopia discussing the winemaking process and features the music he listens to while winemaking and drinking wine. I have yet to meet John, but I like what he's doing with the wines at Bedell. Before joining Bedell, he worked at Paul Hobbs and other Napa wineries as well as in Bordeaux and New Zealand -- bringing an interesting mix of Old and New World experience. As someone who reviews 6-12 wines a week, I dump a fair amount of wine down the wink. I'm no teetotaler, but for the sake of my liver (and preserving things like my job and my marriage) I just can't drink that much wine in a week. So, for a long time, I've found myself dumping lots of wine down the sink. Some is pretty bad, so it's a welcome dump, but there are also a lot of good wines too. I've knocked around the idea of making my own vinegar for quite some time, but when The Obsessed One wrote about his endeavors, it was the kick in the pants I needed. 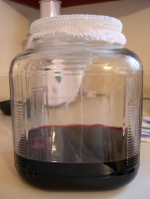 So, I headed down to Arbor Wine and Beermaking in Islip, NY and picked up an introductory vinegar making kit (basically the wide-mouth jar you see here, a mother of red wine vinegar and a piece of cheese cloth). My mother is still in her "beginning" stage, so I mixed it with one part water and two parts wine -- Bedell Cellars 2002 Merlot. I may not have a fancy oak barrel like Derrick, but I'm going to make an AVA-designated vinegar. All of the wine that I use for this batch will come from the North Fork of Long Island. It looks like the Dutch have "borrowed" the original Wine Blogging Wednesday idea, which is coming up on its 22nd vintage in just a few days. Do any of my readers read Dutch? I'd love to find out if it's being presented as an original idea. I'm assuming it's not...I mean, WBW is a worldwide phenomenon that is coming up on its two-year anniversary (can you believe THAT?). Thanks to Tim of Winecast for sending this link over. Too often, the term "food friendly" is meant as a negative in wine journalism — applied to wines deemed unable to bring pleasure on their own. This, of course, is absolutely ludicrous. It's impossible to separate the two. Food and wine are forever intertwined -- like Abott and Costello, peanut butter and jelly, or the Pittsburgh Steelers and Super Bowl rings. Labeling a bottling as a "food wine" should be an accolade, not a comment on its overall quality. Given their pedigree as restaurateurs, it's no surprise that David Page and Barbara Shinn, owners of Shinn Estate Vineyards in Mattituck, bring a chef's sensibility to winemaking. Their new releases, from a fresh sauvignon blanc to a lighter-bodied merlot blend to this aromatic, fun Bordeaux-style blend, these wines are right at Home (also the name of their Greenwich Village restaurant) on the dinner table. 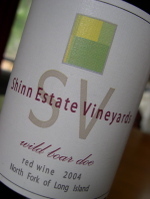 Shinn Estate Vineyards 2004 "Wild Boar Doe" (Boar Doe — Bordeaux. Get it?) ($22), is made with 40% merlot, 23% cabernet sauvignon, 17% Malbec, 15% petit verdot and 5% cabernet franc. Interesting and deeply aromatic the abundant nose is reminds one of local fresh raspberries with wisps of summer herbs and smoky black pepper. The palate is medium bodied and soft up front with peppery red raspberry flavors that lead to a medium-long finish with a little acidity. Sensible use of oak has preserved the fruit character and aromatics in this wine — a great choice in a cooler year. Drink now or over the next three to five years with stews or grilled meat. David told me on a recent visit that they are focusing their style toward highly aromatic wines -- and this wine is most certainly in line with that. All of Shinn Estate Vineyards' wines are made with estate-grown grapes from their North Fork vineyard. 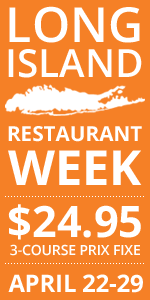 You can the wines in restaurants both on Long Island and in Manhattan, or you can order online from their website. My "corks of the forks" column this week over at Hamptons.com features Raphael, one Long Island winery getting a lot of attention these days. From appearing on The Apprentice to scoring well in the Wine Spectator to making the house red at The Modern, Raphael is making news and bringing attention to the North Fork. Good for Raphael and good for overall Long Island wine industry. This Saturday, Paumanok Vinyeards is hosting "Oysters and Vin Blanc" at its tasting room from 2 -5 p.m. I'm not much for oysters, but I've long been a fan of Paumanok's whites -- including their oyster-friendly chenin blanc, steel fermented chardonnay and sauvignon blanc (which is in its second vintage I believe). Stop by, enjoy some local oysters with local wine. Eric Asimov Warming to Long Island Wines? Many of you have already seen it (and emailed me about it) but being in meetings all afternoon kept my eyes from Eric Asimov's story about some Long Island wines he tasted recently at the American Hotel in Sag Harbor. Let's just say that I think he's much more on target with this story than the last time he wrote about Long Island wines. It's nice to see a respected wine writer like Eric say good things about these "older" vintages. Along with the contention that LI wines are too expensive, lack of cellar worthiness is the other complain I often hear and read about -- sometimes even from people inside the industry. Looking at the wines tasted, I'm sad to report that I've only tasted on of them, Wolffer's 1994 chardonnay (and I happen to have a magnum of the wine myself). Sounds like I should drink it soon. Maybe I'll take it to California with me later this month. Regardless of the fact that I haven't tasted the others, I'm in no way surprised by those particular wines. The winemakers involved are among the most respected locally and they are still making many of the best wines. Most of my other favorites haven't been around long enough to offer up wines from the 1995 vintage. Just like in another other region, there's a lot of plonk being produced here. But there are age-worthy, dare I say world-class, wines as well. Vintage and producer matters definitely matters though. Hopefully Eric will follow up this story with something on this blog The Pour. He tends to go deeper into topics and tell readers more. 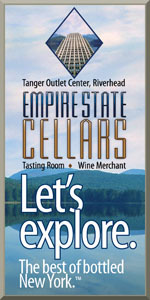 NY Wineries Getting Internet Marketing Help? I've written before about how poor a job, in general, New York wineries do with their websites and Internet marketing. Some wineries don't have websites at all. Others have sites that were built years ago and get updated maybe once a year. And many ignore contact forms and emails that come in via their sites. In short, very few "get it" when it comes to marketing themselves and their wines online. It's a shame really as Internet marketing can be one of the most cost effective forms of marketing available. Of course, some of the smaller producers just don't have the extra money laying around tol put into the intial start up of a quality website. But, New York State is trying to help. The state will make $500,000 available to wineries and vineyards to improve their sites. The funding is designed to help vintners better market their wines out-of-state. Matching grants of up to $2,500 will be made available to vintners. Applications need to be submitted the state agricultural department by Aug. 7, 2006. This is definitely a good thing. But, I hope that Long Island wineries are careful with this money if they get some. I see a lot of East End design agencies taking what little money wineries do have for Internet marketing and producing poor-quality sites. That happens all over the place (both geographically and by industry) but I hate seeing it in my own backyard wine industry. And, I don't think there are many, if any agencies locally that have any wine-specific expertise. It's a definite gap. Saturday morning, Nena and I battled the dreary weather on our way to Raphael to visit "my vines" for the first time, before sticking around for a barrel tasting of 2005 reds (more on that later this week). Winemaker and managing director, Richard Olsen-Harbich met us in the winery and took us over to the row of cabernet franc vines that will be used to make the first LENNDEVOURS-labeled wine. We also learned that Rich went to college at SUNY Cobleskill, just outside of Nena's hometown. Small world when you consider the size of said hometown. The row is right next to the parking lot (so I still have easy access to it when Rich isn't around) and is 50 or so ten year old vines. As Rich said that morning I've gone from not having kids to having 50 children. Right now, there isn't a whole lot for me to do (the vineyard staff is taking care of much of the day-to-day work obviously) but, I'll be stopping by every week or two to take pictures and do a little weeding when necessary. I need to pick out a couple individual vines to take pictures of on every visit to chronicle their progress here on LENNDEVOURS. The coolest thing (at least to me and so far) is that once the fruit sets, I'll be doing my own cluster thinning. Right now we think we're going to thin signifcantly, but time will tell. Check back often as we watch "my vines" grow and bear fruit -- all on the way to making some tasty (I hope) vino. 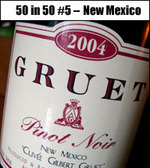 Friday over at Wine Sediments, my tour of America's wine regions continued with a visit to Gruet Winery in New Mexico. Well known for their bubbly, Gruet also makes several still wines -- which are what I focused on. As with Arizona, I preferred the reds. Palmer Vineyards: Where's the Ripeness? As you've no doubt already heard, many vineyards lost some their red wine crop last fall as the East End was pummeled with record rainfall. Unfortunately, Palmer Vineyards was one of the hardest hit, losing almost all of their reds — enough that their 2005 red wines were made using grapes from the Pacific Northwest. But, because most of our area's white wine grapes were harvested before the deluge, the dry, warm growing season expresses it self quite well in many of the 2005 whites I've tasted. Bright fruit that tends more toward the tropical than usual is common and the intensity of flavor is impressive, even if, in some cases, acidity is down. Four recent white wine releases from Palmer Vineyards, however, are a bit-and-miss when tasted against other wines from the North Fork's 2005 vintage. Palmer Vineyards 2005 White Riesling ($17) presents an appealing nose of lightly floral aromas coupled with lemon and lime zest. Light bodied and off dry, the flavors are straightforward with citrus the primary player while light acidity balances the gentle residual sweetness. Sure, the tense interplay of sugar, fruit and acid found in top-flight Riesling just isn't there, but this is a well-made, easy-drinking introduction to the variety. It was my favorite of their new releases and seems a good foil for sweet, just-from-Peconic Bay scallops. If it were priced like last year's bottling, $14, it would be a much better deal however. Gewürztraminer isn't for everybody. Its exotic, perfumed citrus character is quite unique and in the case of Palmer Vineyards 2005 Gewürztraminer ($17), the floral-perfumed aromas and flavors really overpower everything else. The aromas are suggestive of a rose garden with only subtle sweet spice notes. This vintage tastes drier than the 2004, which I thought was a little too sweet, but the 2005's aggressive floral flavors are a bit too dominant. The finish is disappointingly short as well. The least impressive of the new wines, Palmer Vineyards' 2005 Pinot Blanc ($17) leaves one asking "Where's the ripeness?" An almost colorless pale yellow in the glass, dim melon aromas must be coaxed out of a neutral nose by hearty swirling. The palate is similarly tight with only a little melon and vanilla, very low acidity. Even at last year's price, $13, this would only be sufficient as an ice cold thirst quencher on a super hot day. At $17, I wouldn't bother. As I've noted previously, 2005 was a great year for North Fork Sauvignon Blanc so Palmer Vineyards' 2005 Sauvignon Blanc ($17) was a welcome finish to the tasting. The aromas you'd expect with the variety are there — fresh cut grass and herbs, lime and grapefruit — and the fore palate is an impressive intermingling of fruit, herbaceousness and acidity. That initial burst of flavor fades a bit too quickly, but this is a pleasant, if simple, wine to serve with a variety of seafood or salads.